Some orchid stories are epic—like the ancient Central American myth of a goddess who rooted herself into the Earth as a vanilla vine in order to be near the mortal man she loved. Some orchid stories are swashbucklers—tales of the high seas and the plant explorers (and pirates) who braved them in search of orchids from exotic lands. And some orchid stories are mysteries—like the early struggle to understand how orchids reproduce (scientists could not see the microscopic seeds). While gathering orchid stories for this year’s Orchid Show, I came across a story that isn’t quite epic or swashbuckling, but is, in its lovely way, a bit mysterious. Here at the Garden, graphic designer Nancy Snyder has contributed her graphic and artistic talents in one capacity or another for 30 years. Print, banners, signage, exhibition design (her latest project is the Orchid Show)—Nancy has done it all, including teaching classes in drawing and painting at the Joseph Regenstein, Jr. School of the Chicago Botanic Garden. Nancy got her start at the University of Illinois, where she majored first in horticulture and later in medical illustration. The two subjects merged one day when she heard that one of her teachers, Dr. Michael Dirr, was working on an updated edition of his now-legendary Manual of Woody Landscape Plants. 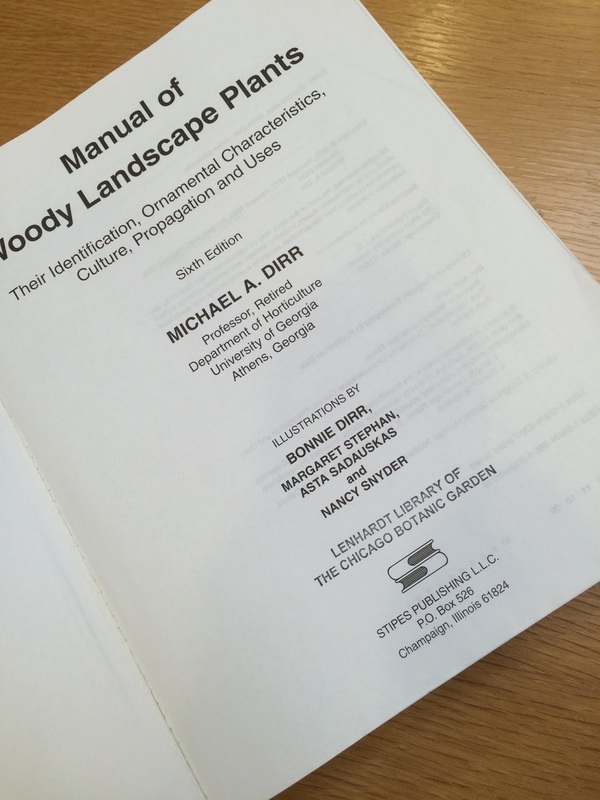 Our own Nancy Snyder’s illustrations grace Dr. Michael Dirr’s classic Manual of Woody Landscape Plants. “I asked if he needed any illustrations,” Nancy recalls now, “and he handed me a star magnolia twig to draw. I took it home, worked all night, and slipped the finished drawings under his office door the next morning. And a botanical illustrator was born. Artist Heeyoung Kim moved to the Chicago area after studying education/psychology and teaching English in her native Korea and, later, in Germany. “I had always drawn, and painted in oils as well, but at age 43, I wanted to do something more serious with art. One day I lined up all my drawings and realized that they were all of flowers.” Shortly thereafter, the Chicago Botanic Garden magazine (now Keep Growing) arrived in her mailbox, and she went in search of the Garden. The first class that she signed up for was Botanical Illustration with Derek Norman. Heeyoung’s natural drawing talent was quickly recognized: eventually, Derek introduced Heeyoung to the native plants of Illinois, a subject that has become a personal passion in her art. The technique of layering thin watercolor washes over and over again produces unexpectedly rich color “that still captures the transparent quality of living plant tissue,” says Nancy Snyder. And then she signed up for her first watercolor painting class. Ever. The teacher: Nancy Snyder. 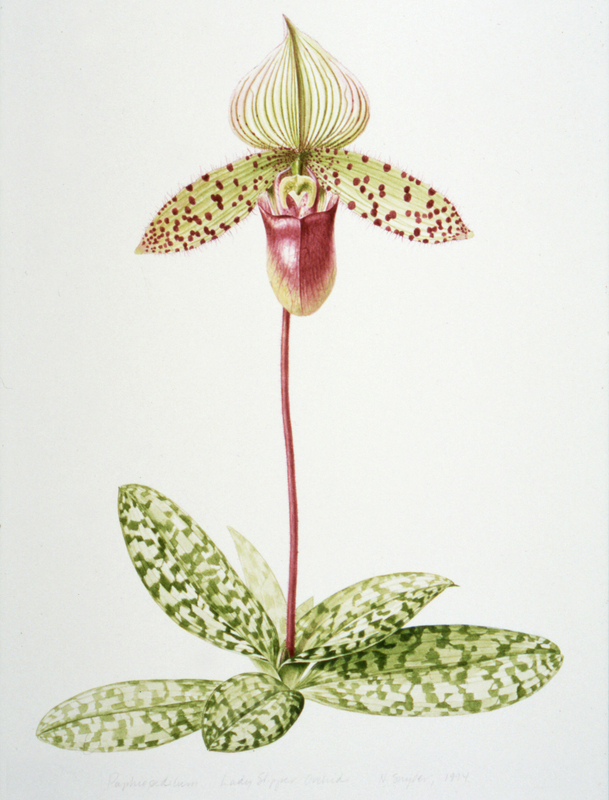 “I saw how Nancy layered the color washes over and over again,” Heeyoung says, “and after her demonstrations in class, I just sat down and started to paint.” Below is Heeyoung’s finished watercolor of a lady slipper orchid from the class. 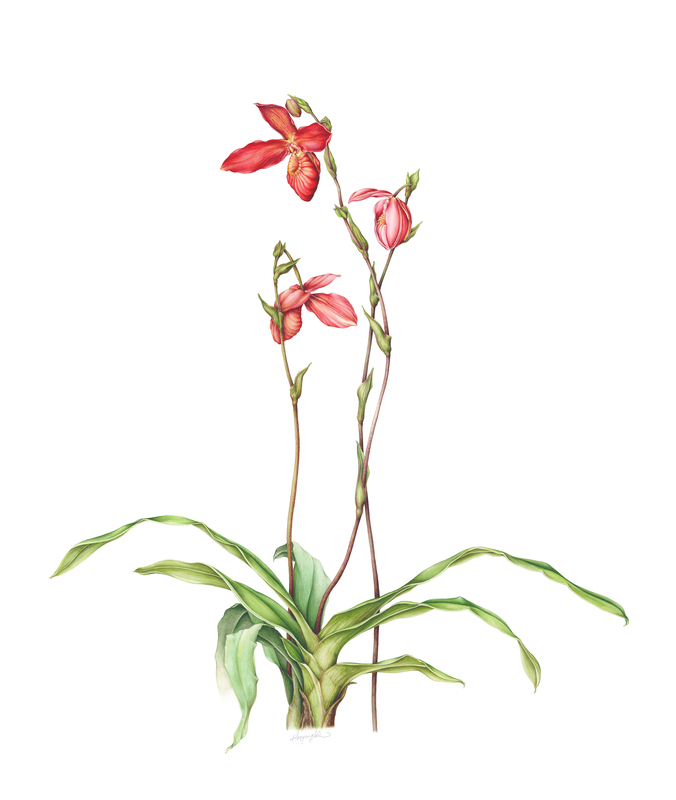 A Phragmipedium orchid watercolor by artist/graphic designer/teacher Nancy Snyder. “I’ve worked hard, and things are happening fast,” Heeyoung Kim says of two exciting upcoming events. Heeyoung Kim has a solo show opening March 27, 2015, at Joel Oppenheimer Gallery in Chicago. She is the first living artist to be represented by that gallery. Three of her drawings have been accepted for inclusion in the Transylvania Florilegium, presently being created under the aegis of the Prince’s School of Traditional Arts, founded by HRH The Prince of Wales. Last November I ran into Heeyoung Kim at the Daniel F. and Ada L. Rice Plant Conservation Science Center and asked her what she’d been working on lately. “An orchid,” she replied, as she pulled out an extraordinary illustration of Cypripedium candidum, one of Illinois’s 45 native orchids. In classic botanical illustration style, each plant part is documented, so that the plant may be identified in every stage of growth. Now, in a delicious twist of fate, Heeyoung’s intricate and delicate drawing is one of the illustrations that Nancy has chosen for the Orchid Show. And that bit of mystery I mentioned at the outset? Heeyoung started teaching classes at the Regenstein School in July 2012. Student…teacher. It’s a good story. At the Orchid Show you’ll not only see 10,000 orchids, but also the talents of two students who became two Garden teachers.